EYEMAGINE wins Interactive Media Awards' "Best in Class" award in the ‘Lifestyle’ category with perfect scores in two out of the five criterion and an overall score of 487 out of 500. 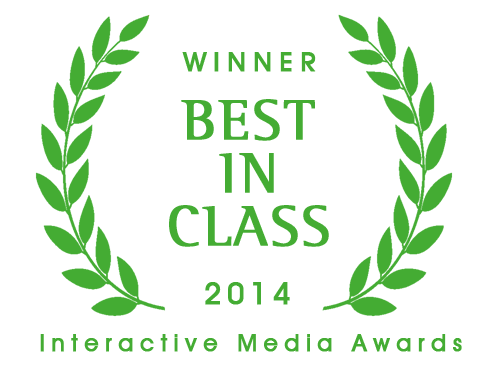 The Best in Class award is the highest honor bestowed by the Interactive Media Awards. It represents the very best in planning, execution and overall professionalism. In order to win this award level, the site had to successfully pass through a comprehensive judging process, achieving very high marks in each of the judging criteria - an achievement only a fraction of sites in the IMA competition earn each year. cinda b chose EYEMAGINE as its preferred eCommerce agency to complete a custom, responsive eCommerce store to stay ahead of the curve. EYEMAGINE broke boundaries and built a Magento Enterprise responsive design from the ground up to create a classy, custom eCommerce website for cinda b. The overall responsive design of the cinda b Magento Enterprise store breaks traditional conventions for eCommerce. Responsive web design provides a remarkably seamless shopping experience across all device types. 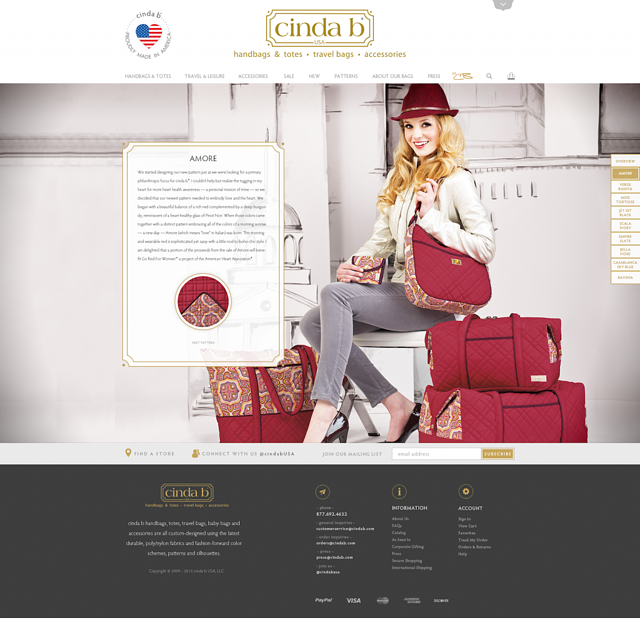 With increasing online traffic coming from mobile and tablet devices and mobile commerce on the rise, responsive design was a no-brainer for cinda b's eCommerce facelift. Long-scrolling, top-down navigation gives customers an easy shopping experience. A unique patterns page was designed with a persistent side navigation bar to effortlessly guide customers through various product patterns, a key differentiator of the brand. Customizations of the Magento Enterprise ecommerce platform allowed for greater efficiency in shipping, fulfillment and inventory management. An ERP integration was built into the platform to successfully update order status, send orders in for inventory management, create a ready-made shipping label, transfer all order statuses to the Magento admin panel, and send the tracking number back to the customer. Gifting, wish lists, gift-card templates and full-page caching were implemented in the cinda b eCommerce site for an enhanced user experience and advanced performance. Social media platforms are integrated into the site homepage to help build and promote a community for shoppers. 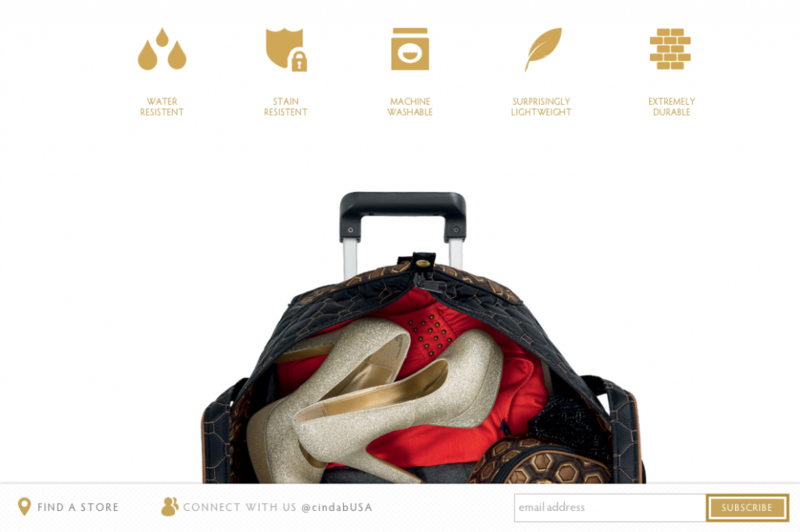 Along with the direction of cinda b’s Marketing and Design team, EYEMAGINE was able to build a fresh, distinctive and immersive shopping experience that perfectly displays cinda b’s beautifully constructed handbags, totes, travel bags, and accessories. EYEMAGINE would like to express gratitude to the cinda b team. We are thankful for the opportunity to work together with cinda b as their partners to win this outstanding acknowledgement from The Interactive Media Awards. The Interactive Media Awards™ recognizes the highest standards of excellence in website design and development and honor individuals and organizations for their outstanding achievement. Created by the Interactive Media Council, Inc. (IMC), a nonprofit organization of leading web designers, developers, programmers, advertisers and other web-related professionals, the competition is designed to elevate the standards of excellence on the Internet and offer winners a boost in marketing and exposure.